Origin: Southwest United States and Mexico; characteristics including form highly variable by region. Landscape Use: Native gardens and local restoration landscape projects. Form & Character: Winter deciduous tree, broadly asymmetrical, sprawling, multiple trunk, shrub like, contorted and twisting with age. Growth Habit: Irregular spreading and randomly branched, thorny shrub or small deciduous tree, 25 to 50 feet tall, 15 to 25 feet spread; mature bark is thick, rough, dark brown, shredding in strips, while the bark on young stem is green, helping in photosynthesis. Foliage/texture: Complex bipinnate compund leaves to 5 inches long with a feathery appearance. Compound leaves have sometimes two, but usually four pinna. Each pinna generally has 14 to 30 pairs of dark green, short, and closely spaced leaflets, 1/3 to 1/2 inch long. Early spring foliage is pubescent. Leaves stipules possess variable spines in pairs that can grow up to 3 inches long (though generally they are shorter); medium fine texture. Flowers & fruits: Flowers are a white or pale yellow catkin, 2 inches long, bloom in May and are relatively inconspicuous because of color and canopy position; fruit a slender, mottled, brown pod, 3 to 9 inches long and 1/2 to 1/4 inch wide; edible. Watering: Apply drip irrigation during the first year after planting into the landscape (except if it's planted in a lawn....don't laugh folks, I've seen this done before on a University campus no less). One year after transplanting the drip emitters should be plugged as velvet mesquite trees will need no more supplemental irrigation. Pruning: Arizona mesquite is very difficult to train into a tree with an upright habit that is conducive for use in space restricted urban landscapes. Beware of long, blood-rendering stipular spines when pruning. After pruning, Arizona mesquite can sucker profusely at its base as well as grow water sprouts from and below pruning cuts any where within the tree's crown. Arizona mesquite usually requires extensive staking until established in the landscape especially if an upright habit is desired. Propagation: Seed and air layering using protocol that is similar to other mesquite taxa. Disease and pests: Aphids on new growth during the spring. Also, Texas root rot has been observed to occur during later summer on trees that are in excessively wet landscape sites. 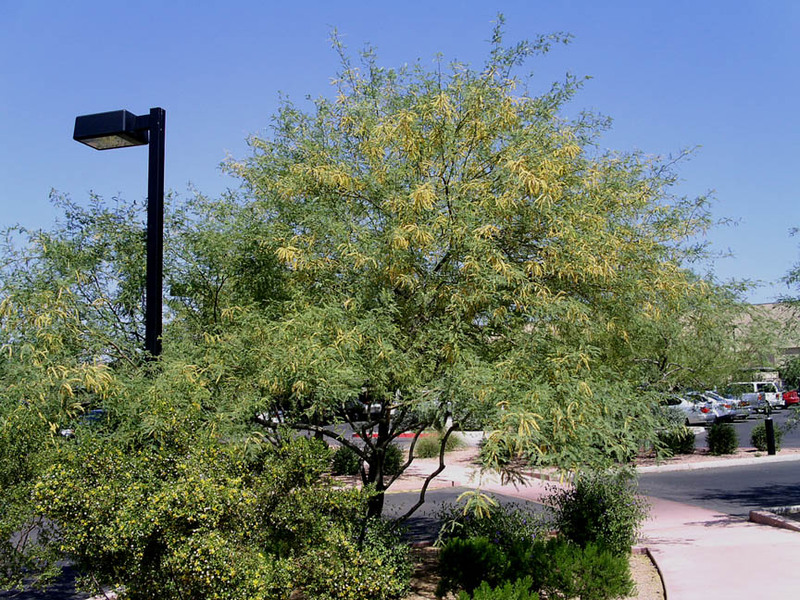 Additional comments: From an aesthetic vantage point, Arizona mesquite is a rangy, unattractive tree of limited landscape aesthetic value other than for non-irrigated native desert garden plantings and/or desert restoration projects. It is actively naturalizing in many areas of the Phoenix metro area.